There is this girl named Ricki and her dad is constantly nagging her to improve her grades in school. But Ricki is having a hard time concentrating in class. And her mom's very busy with her job and hardly any time to sit and talk with her daughter. Life for her is difficult but it's not her parents that is on her mind, it's Diablo. This beautiful horse is being seriously mistreated by his owner and Ricki decides she will be the one to do something about it. But when Ricki's mom forbids her to set foot in the stables, Ricki is absolutely devastated. Ricki's passion for Diablo is too strong, and she takes the matter into her own hands, which means running the risk of saving Diablo from his cruel owner and disobeying her own mother. But not even in her worst nightmares could Ricki have imagined what is in store for her. Diablo's owner is not only cruel to animals, he also has no qualms about attacking people too! I don't know if I have read this book yet or not, but I do know that I have read some of the Diablo series and the ones that I read, I really enjoyed! It's about a girl named Ricki and her black horse Diablo. Totally awesome, couldn't put it down!!!!!! i hate reading and when i read this book i couldn't put it down it made me cry when cooper hit the horse and ricky. i love this book have to do a 5 page report on it so bye gotta get started. 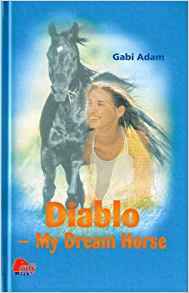 The "Diablo" Series is about a 13 year old girl named Ricki and a Black Gelding named Diablo. The Diablo books can be found on http://www.pony.us/ , Amazon.com, and eBay. Sadly PONY will be closing this Fall due to Membership going down. O.M.G. THIS BOOK IS ON MY TOP 10 LIST!! this book was grr8t i luved it ... made me want 2 cry ='( U got 2 read this book will never 4get it! Ricki,the main character,is horse crazy. One day after her lessons she finds this horse, Diablo who's owner just left him with his saddle and bridle on. Ricki and her friends cut up his tack.I'm not going to say anything else because you have to read the story. This is the best book I have ever read in my ENTIRE life! I got a horse that I fell in love whith a couple of years ago, so I know how ricki felt when she got Diablo!!!!!!!!!!!!!!!!!!!!!!!!! There are 17 books in the series. I know because I have them all! I loved the book. i have to do a book report on it, and we have to act as the characters, as they are being revieved by a reporter. Im Ricki, and My horse, Dakota is diablo, because he looks like diablo, has the same markings, and was abused in his past, as well. GREAT JOB! its a great book! i love horses! Gabi Adam i love this book!!!!! I havent read it yet! But i have a Quest?! Hey everyone, I have been searching and searching and I was just wondering if anyone knew how many books there are in the series and whats the order...like which one is 1st 2nd 3rd and so on and so on. I would really love to know so i could start reading for book report I'm doing please comment me back asap!! Thx again!! This book was awesome I loved it I never put it down it was a amazing horse and the book was cool too. Riki's dad is constantly nagging her to improve her grades at school, but Riki's having a hard time concentrating in class. Her mom's very busy with her job and hardly has the time to sit down and talk with her daughter. Life for a teenager can be very difficult, but it's not really Riki's grades or parents on her mind- it's Diablo. This beautiful horse is being seriously mistreated by his owner, and Riki decides she's the one to do something about it. But when Riki's mom forbids her forbids her to set foot at the stables, Riki's absolutely devastated. Riki's passion for Diablo is too strong, and she takes the matter into her own hands, which means running the risk of saving Diablo from his owner and disobeying her mother.